I guess I’m not as LAZY as I thought. Don’t get me wrong, I’m still LAZY, just not as much as before. I could’ve made quick work of the following recipe by simply opening up a jar of “It’s in there!” Instead, for no apparent reason, I opted to take a longer approach in creating the following spicy little first-course dish. Maybe I had an epiphany while looking in the fridge to see what I could whip up next, if one can actually have an epiphany while peering into an ice-a-box. Or, maybe I was just pleased with the way the previous Lazy Person recipes turned out that I subconsciously told myself, “You can do this.” Ergo, not as LAZY as before. Well, whatever the reason, the final result plated on the dish was pretty good and, I think, worthy of sharing with my sorta, kinda clueless-in-the-kitchen-somewhat-lazy mates. So, this time around, I’d like to take you through all the steps involved in preparing the Lazy Person’s Semolina No. 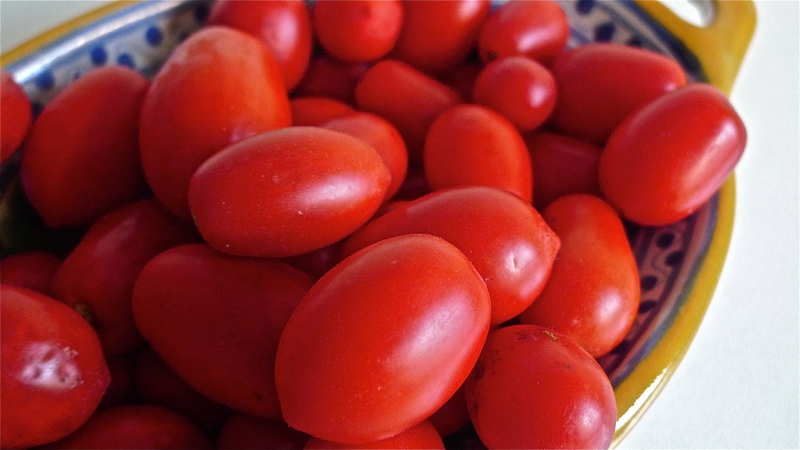 5 in Red Sauce Minor – Dah-Dah-Dah-Daaaaaaaaah – or LPS5RSM for short. 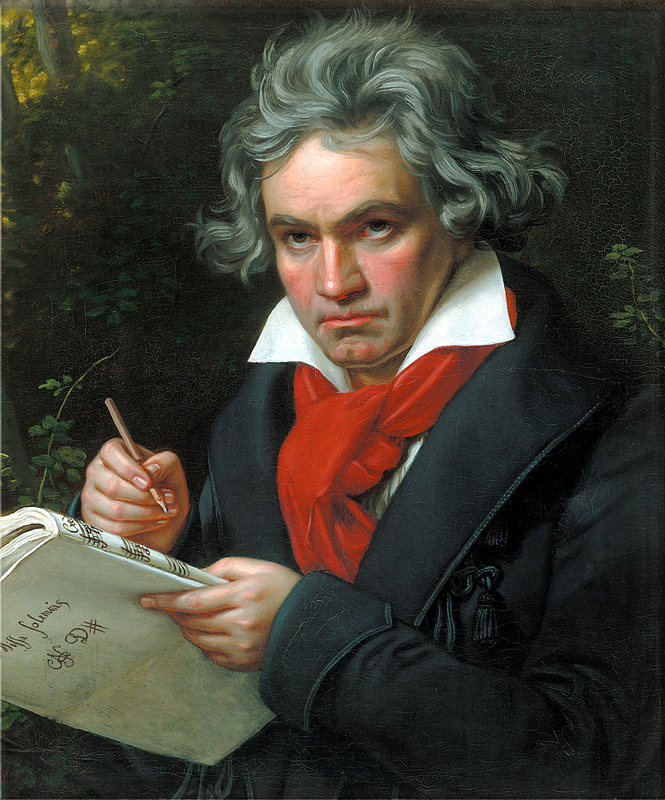 With apologies to Ludwig van Beethoven, the LPS5RSM is a symphony of sorts, as we blend overlapping flavors from olive oil, peeled pomodorini (cherry tomatoes), garlic and spicy red pepper – like the short-short-short-long motif of one of LvB’s most often played compositions, Symphony No. 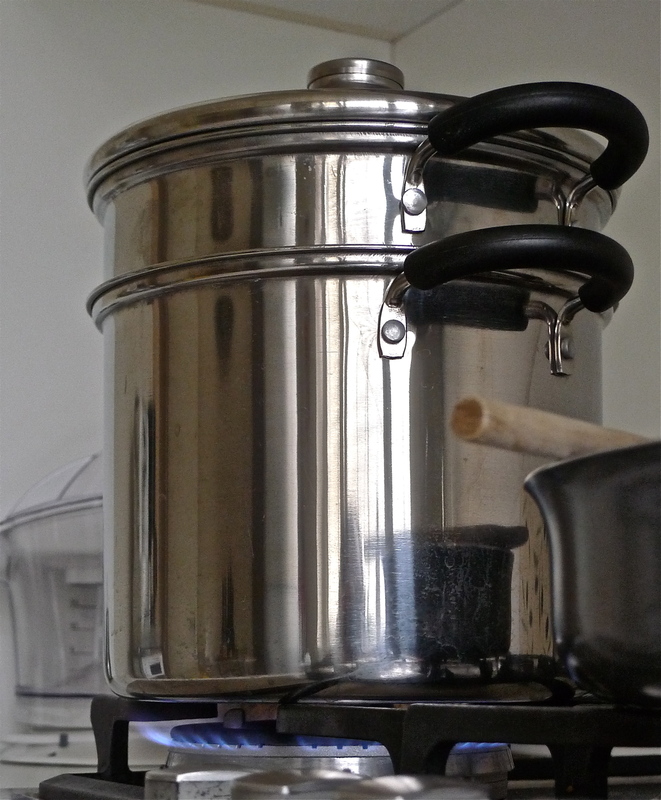 5 in C Minor – into a culinary opus, the sauce. 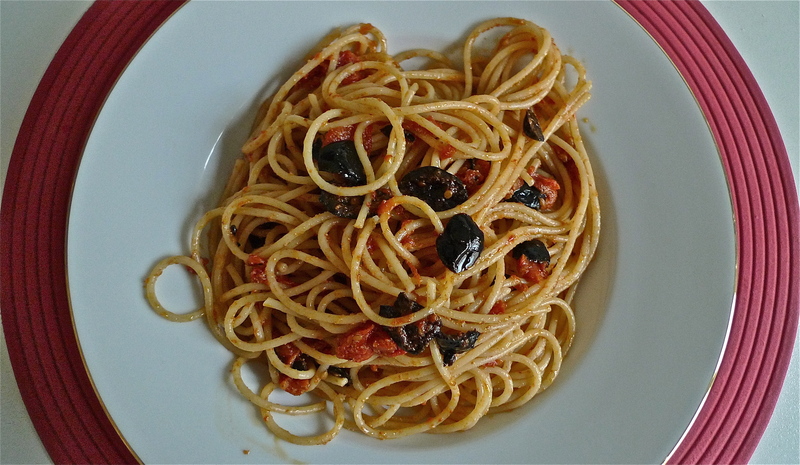 And the baton of the maestro (conductor), who will lead the ingredients, is one narrow box of Semolina (Durum wheat flour) spaghetti, size no. 5. 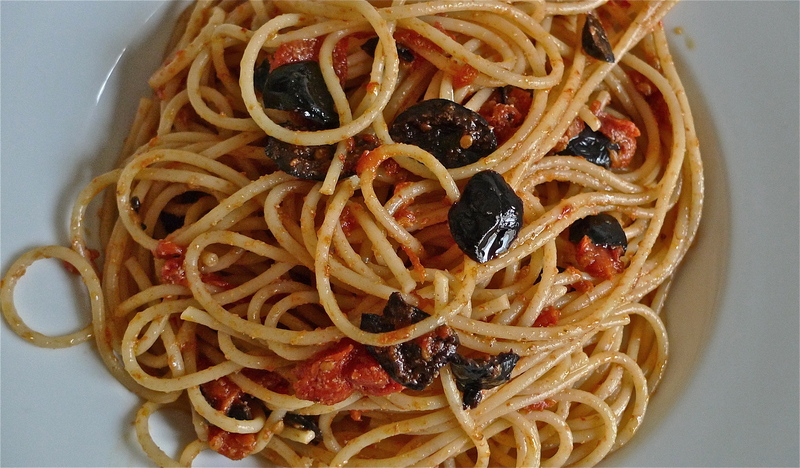 Before we head into the kitchen, you might like to know that the Italian word spaghetti translates as “little strings.” How appropriate for our quasi, classical music-themed LPS5RSM recipe. Now, if you’ll give me a second to slip into my white tie and tails, we’ll get this symphony underway. I just hope I’m not wearing some of the red sauce at the end. Prep and Cooking time: 15-20 min. 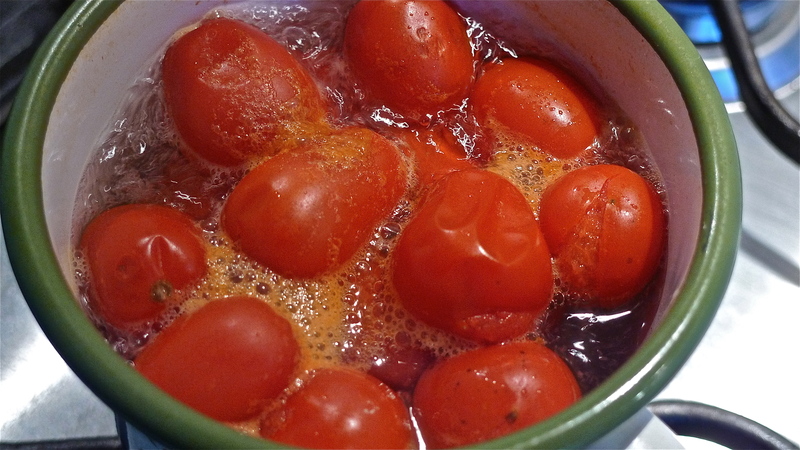 Step-2: Rinse, clean and score the cherry tomatoes, then place them into a small pot of boiling water. Wait about 30-sec. to 1-min., then remove. 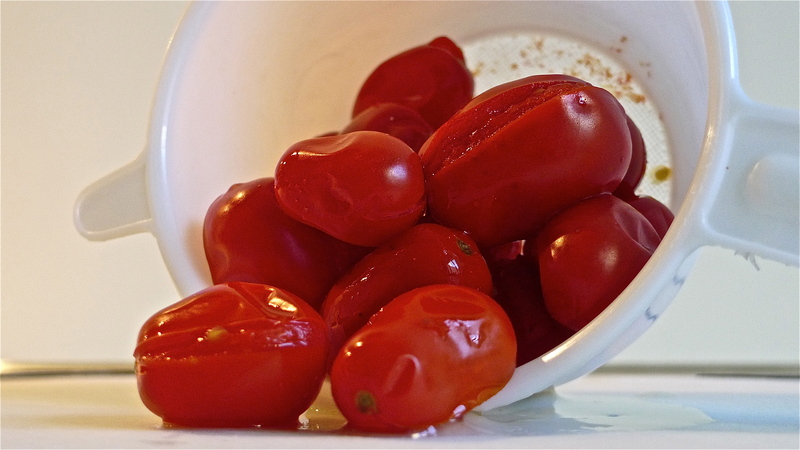 Step-3: Place the hot cherry tomatoes in a hand-held medium strainer, rinse lightly with cold water to cool down. 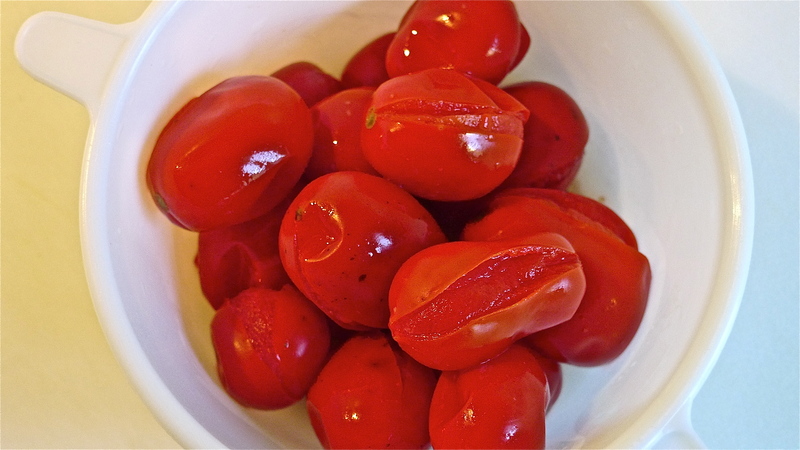 Step-4: Begin hand-peeling the cherry tomatoes, placing the skinless pulp on a cutting board then randomly slice. 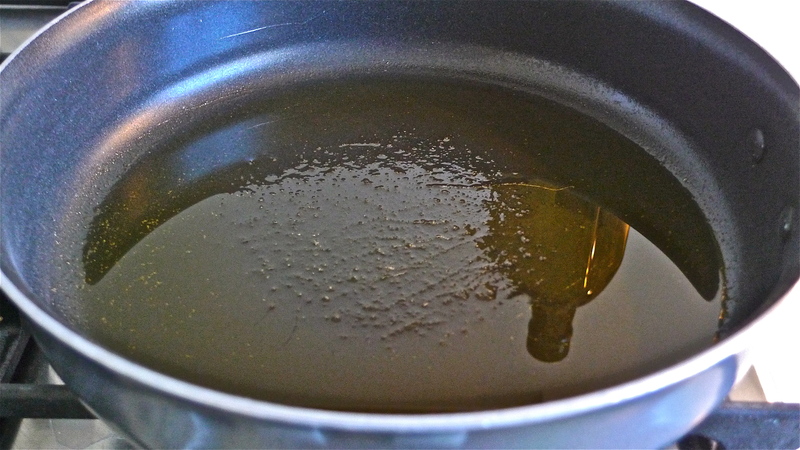 Step-7: Pour the olive oil into the skillet rotating it around until the pan is completely coated. 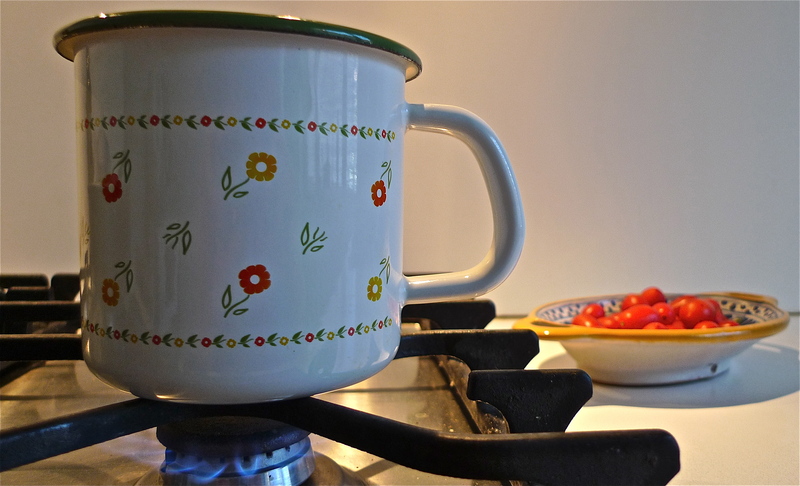 Set the burner on MEDIUM heat and warm the oil for 1-min. DO NOT BURN THE OIL. 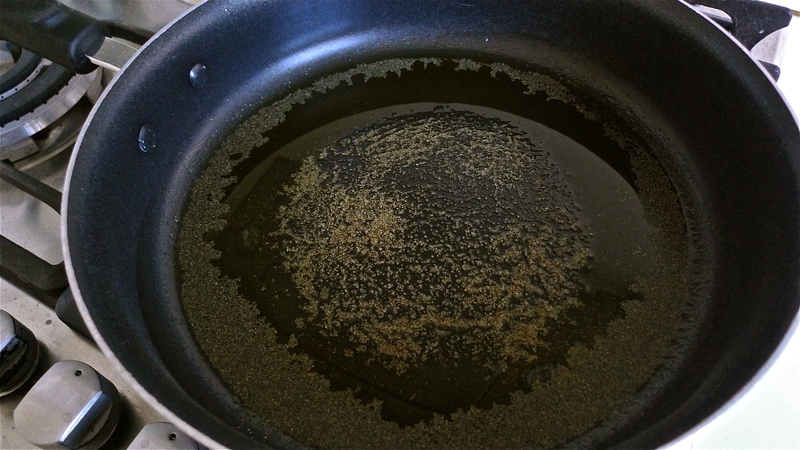 Step-8: When the olive oil heats up, introduce the quartered garlic pieces and stir. 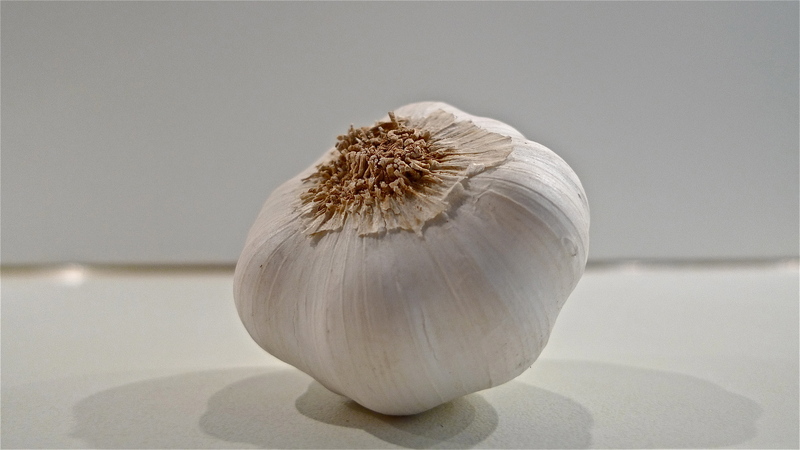 Once the garlic starts to brown, turn off burner and remove the garlic pieces from the skillet. 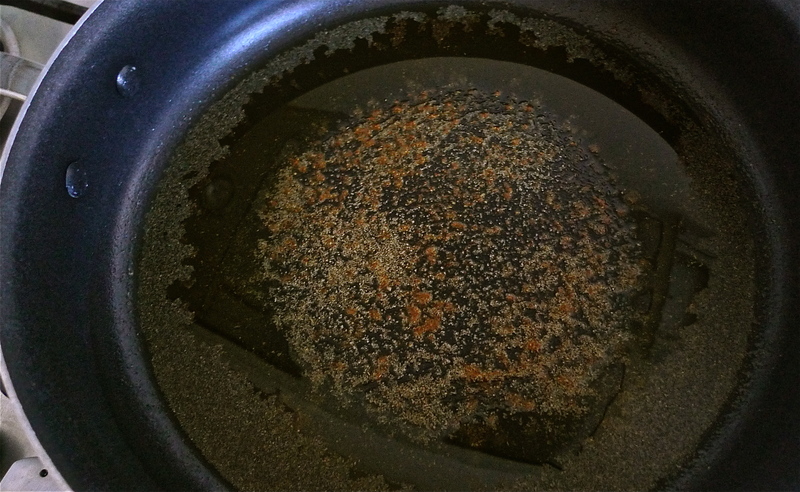 Step-8a: If you’re using garlic powder instead of the cloves, like I did (remember, I’m kinda LAZY) sprinkle it over the warm oil and stir it around for about 1-min., then turn off the burner. 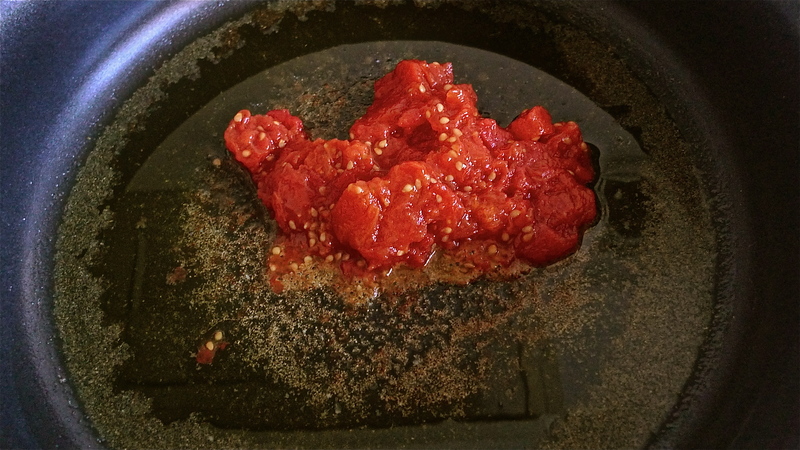 Step-9: Add to the oil the dried crushed or powdered red pepper, stir briefly, then set the skillet aside. 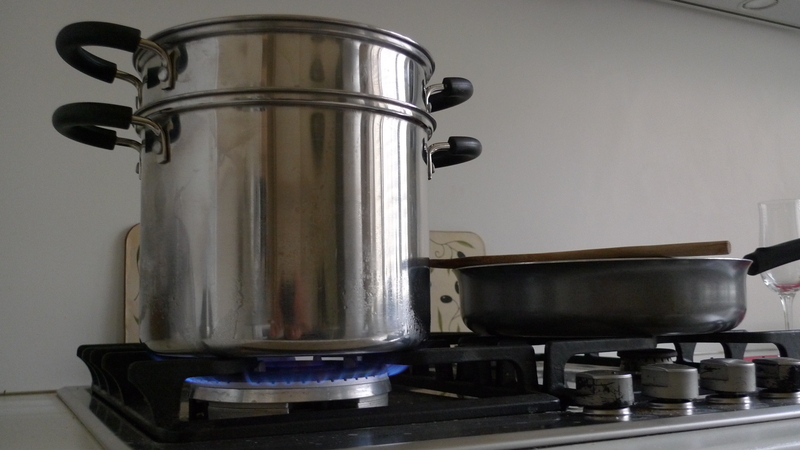 Step-10: The large pot of water is now boiling. Remove the lid and add the 2 tablespoons of Sea Salt. 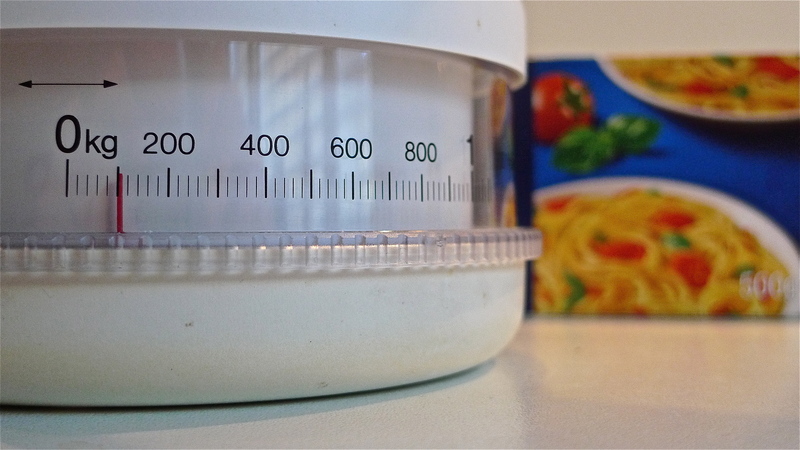 Weigh the pasta to ensure the correct amount. 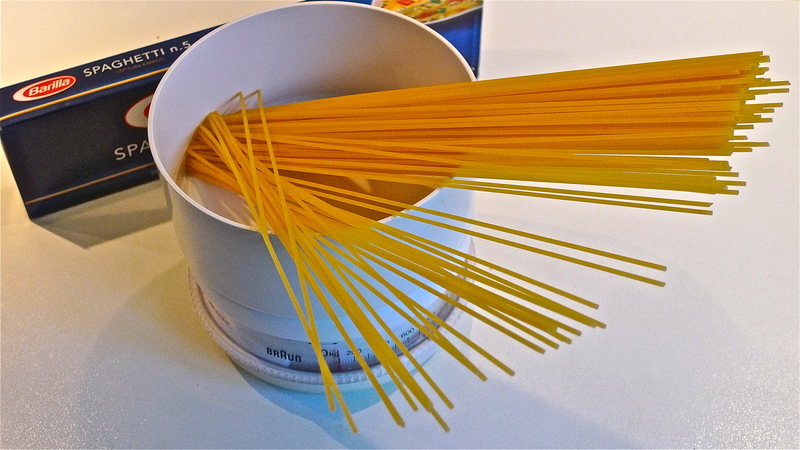 Step-11: Drop the dried spaghetti into the water. Push the strands down with tongs until they are all submerged. 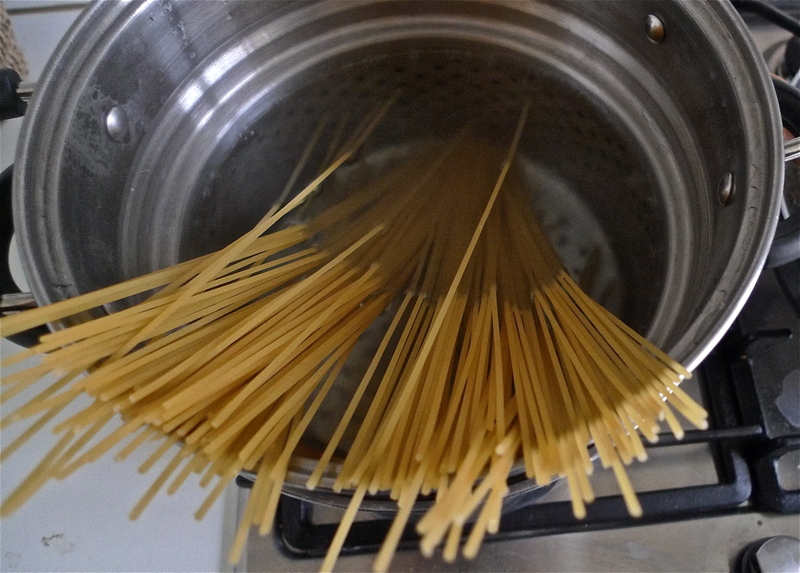 Stir the spaghetti around during the first minute or so of cooking to ensure the strands do not stick together. 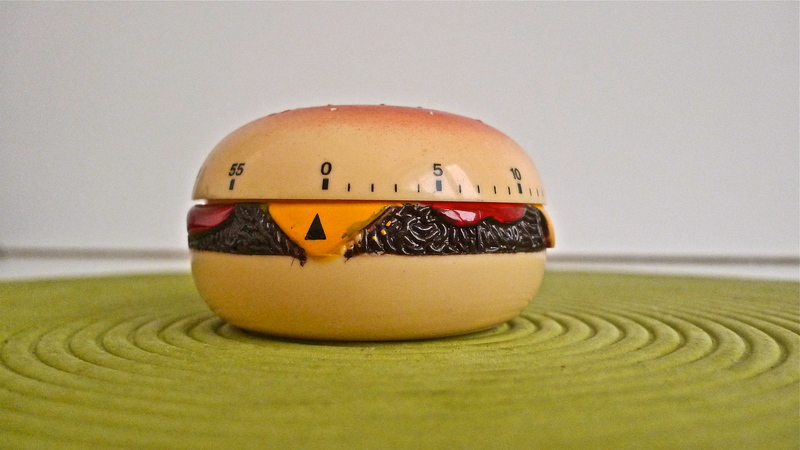 Set the timer for 7-min. and let the pasta cook. Note: Cooking time for no. 5 spaghetti is 8-min., but we’ll subtract 1-min. and use that time to quickly sauté the pasta in the red sauce (Step-14). Step-12: While the spaghetti is cooking, return the skillet to the burner and place on MEDIUM heat. 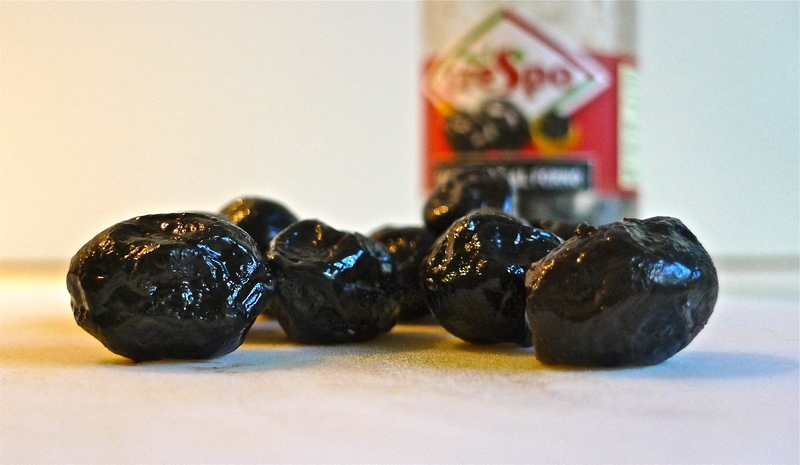 Fold in the cherry tomato pulp, the black olive pieces, and 2 tablespoons of the boiling, salty spaghetti water and stir for 2-min. 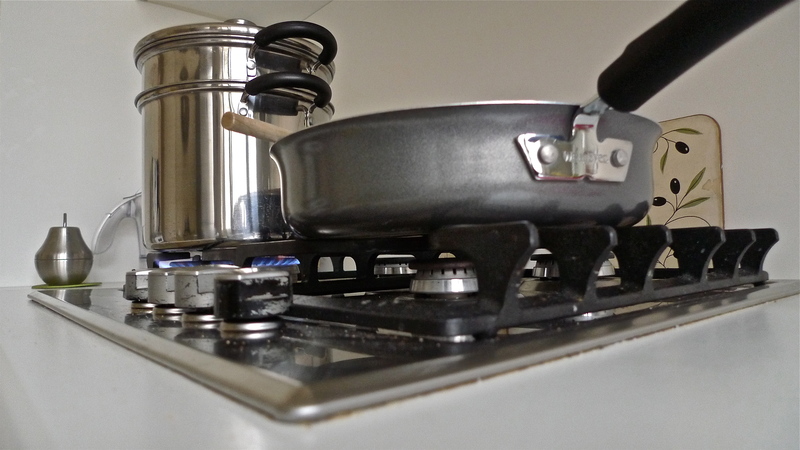 Turn the burner down to LOW heat and wait for the spaghetti to finish cooking in the boiling water. Step-13: RING! The timer hits the 7-min. mark. Turn off the burner. 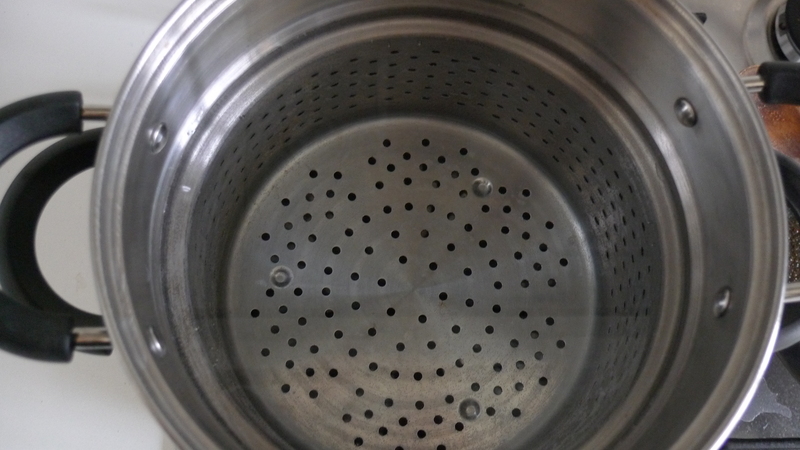 Drain the spaghetti in a colander and shake off the excess water. 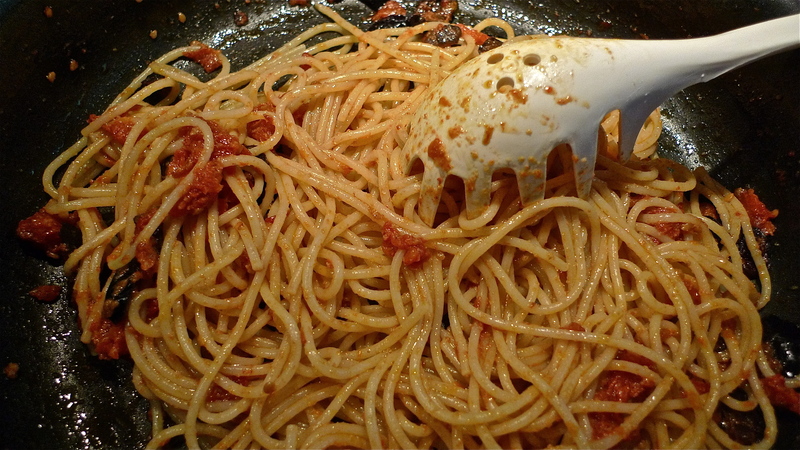 Step-14: Throw the cooked spaghetti down into the skillet where the sauce has remained warm. Raise the burner to MEDIUM heat and sauté quickly for about 30-sec., or until all the “little strings” are bathed in red. Step-15: Turn the burner off. 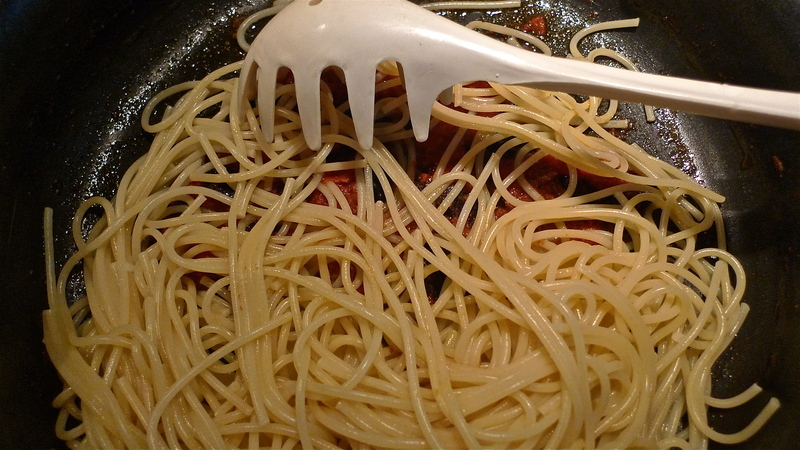 Plate the spaghetti with kitchen tongs. Serve. 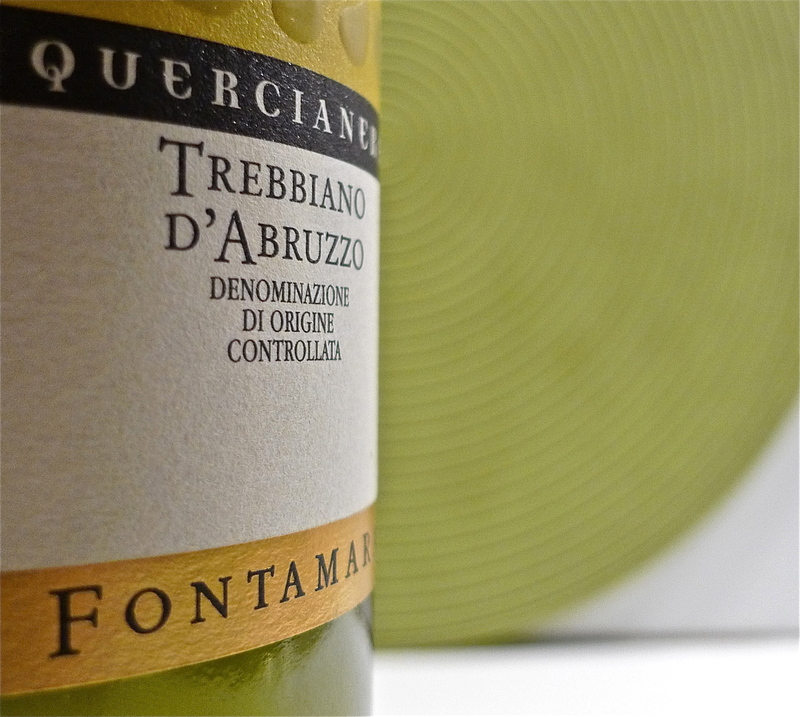 Recommended Wine Pairing: Fontamara’s Trebbiano D’Abruzzo DOC Quercianera – A straw-like pale yellow from the heart of the Valle del Sangro in the Abruzzo region of Southeast Italy. 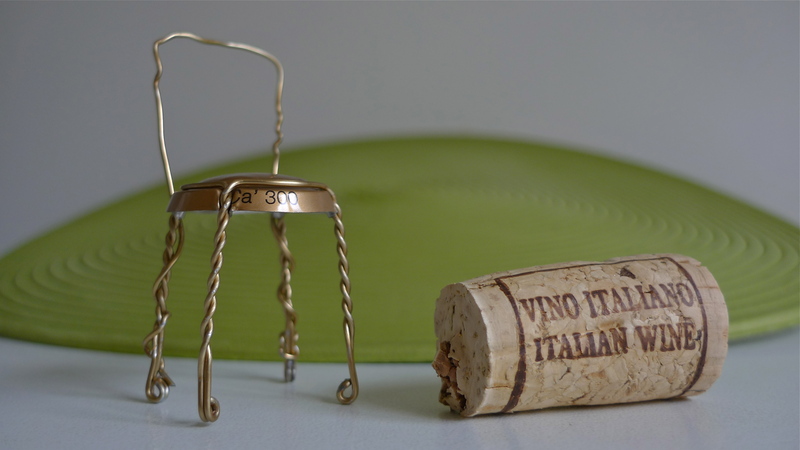 To the nose, you’ll take in a floral bouquet accented with hints of ripe yellow fruit. 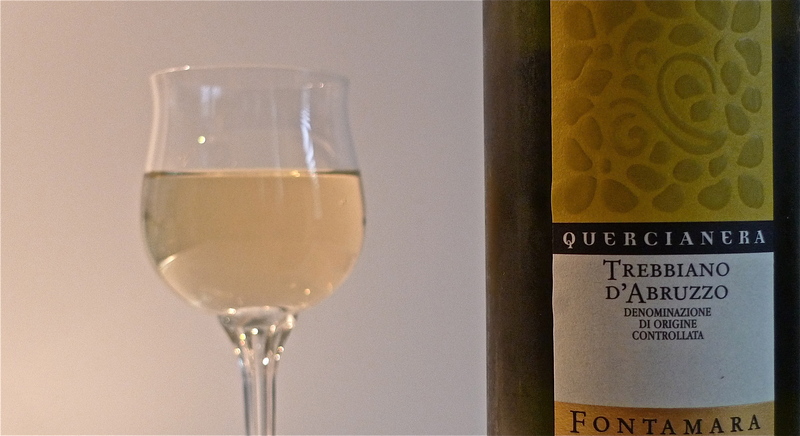 This well-structured, 100% Trebbiano is nicely balanced, fruity and persistent. Well, I’ll be darn. I didn’t get a spot of red sauce on my white tie and tails. I hope you enjoyed the Semolina No. 4 in Red Sauce Minor. Do let me know how you faired in “conducting” your interpretation of it. In the meantime, I’ve gotta dash over to the tuxedo rental shop before it closes and return this monkey suit. Okay, I get it with Italian cooking. 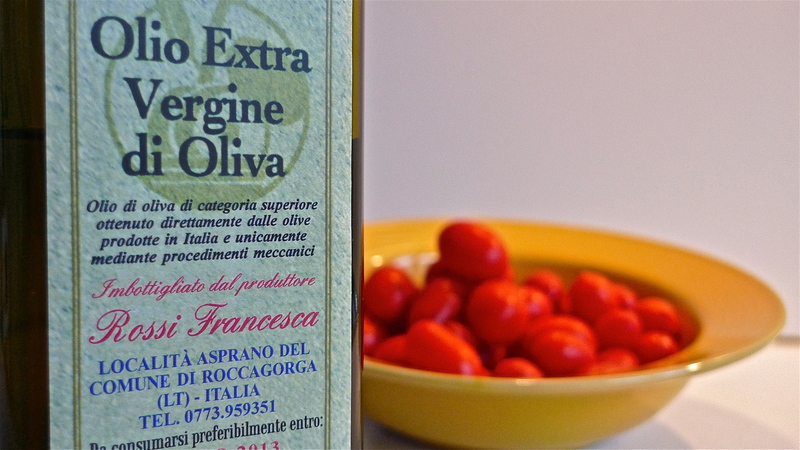 Simple ingredients that we like, prepared simply. 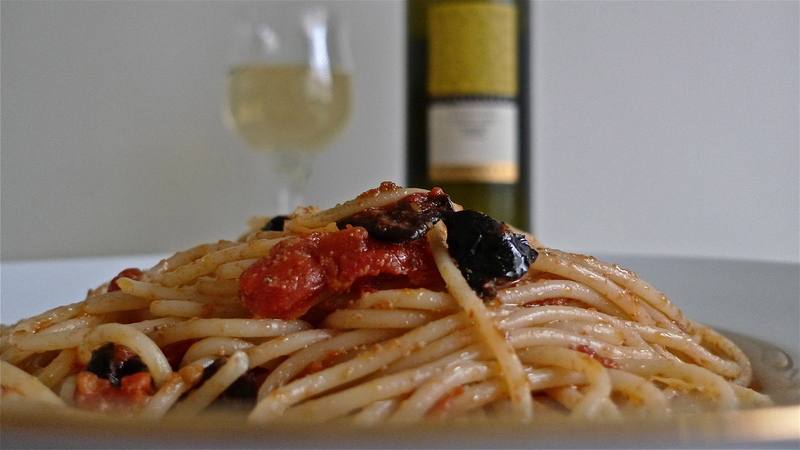 Mix with pasta and serve with wine. I can do that. 🙂 We have fabulous gulf shrimp here, so I think I’ll make a variation of the mussel (not our favorite) pasta. Oh my, I am salivating already and it is only 9:30 in the morning. Great fun. Life is soooooooooo good. 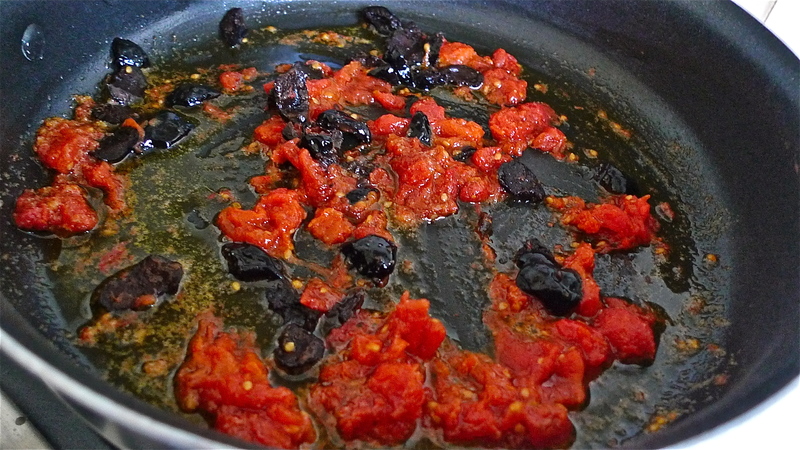 I make a sauce with fresh cherry peppers & garlic, too. Topped with a little parsley? 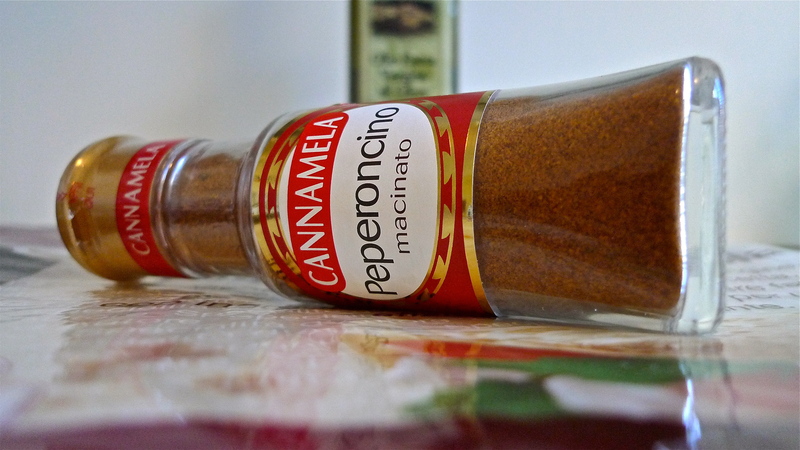 Heavy on the crushed black pepper? Love it like oxygen. I hadn’t considered using olives, though. Filing this under “future reference”. Thanks! Parsley on top at the end would be good, too. I didn’t have any at the time. Black pepper? I used crushed red pepper to add a bit of heat. Glad you enjoyed the recipe and have filed it for future reference. Buon appetito! I’m salivating as I read this. That looks fabulous. And then a lovely wine to go with it. Perfect. When I make spaghetti, I like to dribble the sauce over the top of the noodles and serve that way. Others, like yourself, mix them together. Is there a reason for the different styles? I saute the pasta in the sauce before plating to ensure every strand is well coated. Guarantees a consistent taste from top to bottom. Try it that way next time.